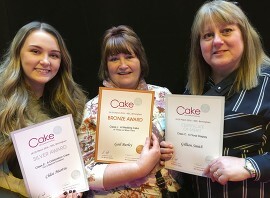 All 3 of us in the above photographs are CAKE INTERNATIONAL AWARD WINNERS ALL THE WAY TO GOLD!!! So, your cakes and decorations are safe in the hands of our professional team. As the founder of Those Finishing Touches, Gillian has been crafting creative cakes for over 40 years. Having an artistic flair since childhood, you know your cake is in good hands. Chloé joined the team as an apprentice in 2013 and has been an invaluable asset since then. Now a Level 1 qualified sugar craft artist she is ready to turn your dream cake into a reality. Since day one, Gail has been attending our classes and workshops in the hope of becoming an expert baker. Joining our team in 2014 she now lives her dream of bringing creative cakes to you. As Curriculum Leader for sugar craft at Sheffield College and a British Sugar Craft Guild accredited judge, Chris is the ideal tutor for cultivating your talents in our workshops. 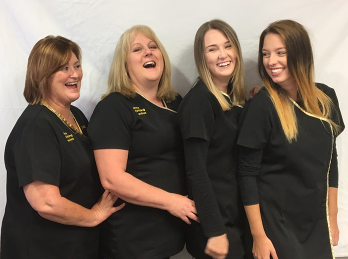 Chloe joined us as an apprentice in March 2017 and WOW has she picked up the craft. Her first wedding cake creation, ever, is good enough for us to display at Wedding Fayres. Karen is the backbone of our wedding fayres. Always there to give you as much information as she can to help you with those important planning decisions. Carla is a very talented young lady. As the resident Saturday girl her skills are forever growing. Watch out for this up and coming Star Baker! Daisy’s Beauty – wedding makeup and therapy. Labella Brides – wedding dresses and attire.